Dear reader, let me take you back, back to a time when there were two friends, who lived in two different countries, who both loved to run, and often wished they could run together. 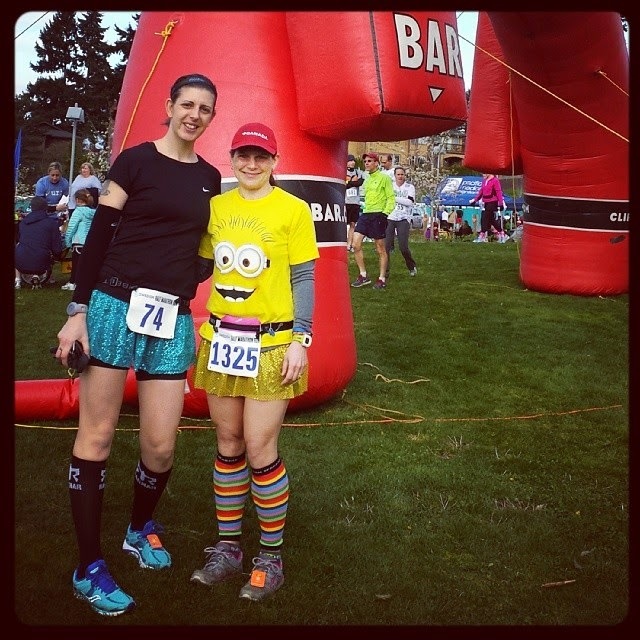 Twice they ran a 10K together (this one and this one), but they had bigger dreams, they wanted to team up for a half marathon. Alas, one of the runners, she was incredibly injury-prone, and it just wasn't looking like it was in the cards to run the half together . . . until a few weeks ago. Out of nowhere, the injured runner was making great progress in her training plan towards a full. The non-injured, Canadian-born runner was game. 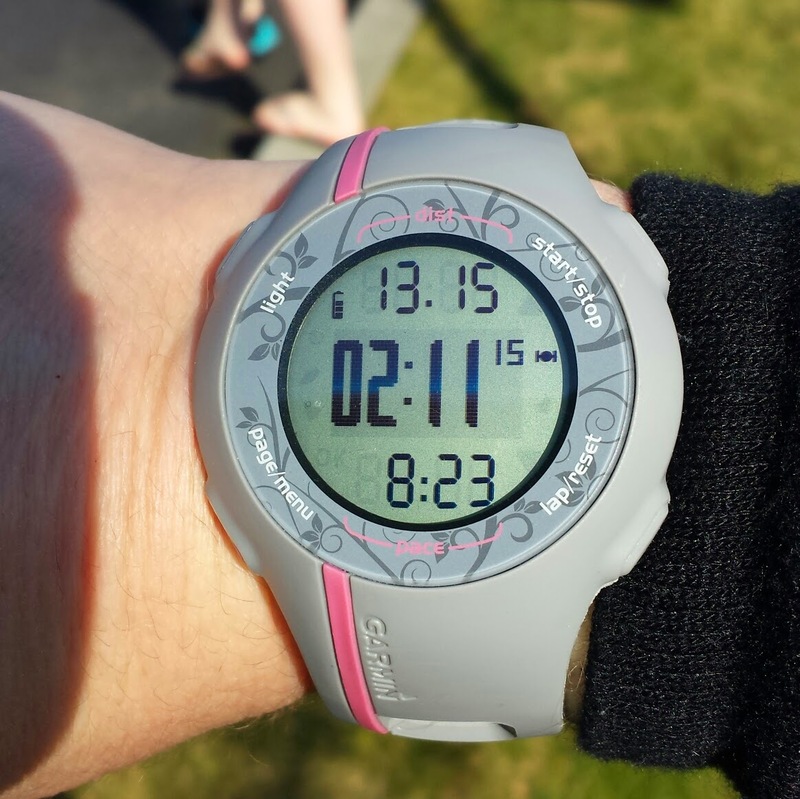 The injured runner found a half marathon that fit in to her schedule. The non-injured runner booked a ticket on the ferry to sail down to the states. A plan was made. THEY WOULD FINALLY GET TO RUN A HALF MARATHON, SIDE BY SIDE. I'm so tricky, right? I'm that injured runner. 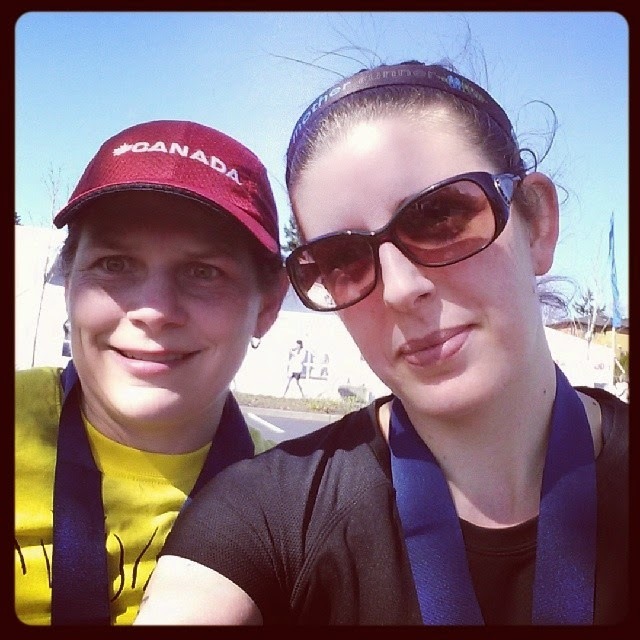 My dear friend Tara is the non-injured runner. On Saturday night, after stuffing our faces with open-faced turkey sandwiches and Molly Moon's ice cream, Matt and I picked Tara up at the ferry terminal. We came home, chatted about things, and headed to bed. 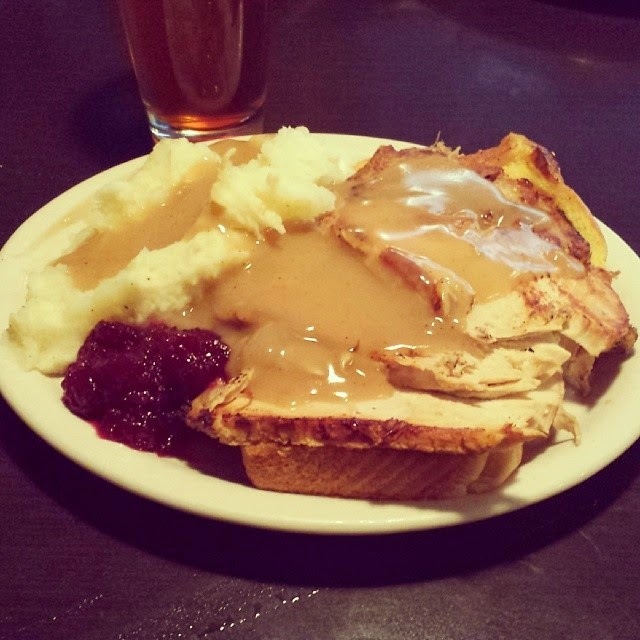 Carb loading at it's finest. The first wonderful thing about the Mercer Island half is, if you are running it (as opposed to walking it), the completely decent start time of 9:00 am. I was worried about the seemingly complicated parking situation (several parking lots all over the island with shuttle buses to the start) so we left the house at 7:30, go to Mercer Island at 7:45, and ended up parking a few blocks from the start line in a huge lot. We were at the start at about 8:00am. Easy peasy. I didn't pick up our bibs early, so we headed in to the community center gym. It was extremely well organized for packet pick-up. We got our stuff, attached our bibs to our belts, then checked our gear before choosing to stand in a long line for the inside bathroom. Of note, however, is that on our way to packet pick-up we noticed a long line porta potties with no lines. We chose to wait inside because it would kill time and keep us warm until the race started. It was the perfect decision. Once we headed back outside we lined up pretty far back in the pack and the race began. Tara and I, ready to run! The first couple of miles were fairly crowded, but not annoyingly so. Tara and I kept around a 10:30 min/mile pace during the early miles. Eventually the crowds spread out, and the rolling, twisting course was laid out before us. I seriously think there were less flat spots than there were hills on the course! The course followed Mercer Way around the outer edge of the island, in a clockwise fashion. The inner lane of the road was closed for runners, the outer lane was open to cars. Truth be told, I absolutely loved the hills. The only thing I didn't like about the road were the parts where it was quite slanted. The course had plenty of water stops, some of them with nuun available. When there was nuun I always took that, as I already drink it daily and knew it wouldn't upset my stomach. There was one gel station with Clif shots, around the half way point. I took one of my own gels around mile 5, then held on to my Clif shot to take around mile 9. I absolutely LOVE vanilla Clif shots, so I was thrilled that they were available on the course. 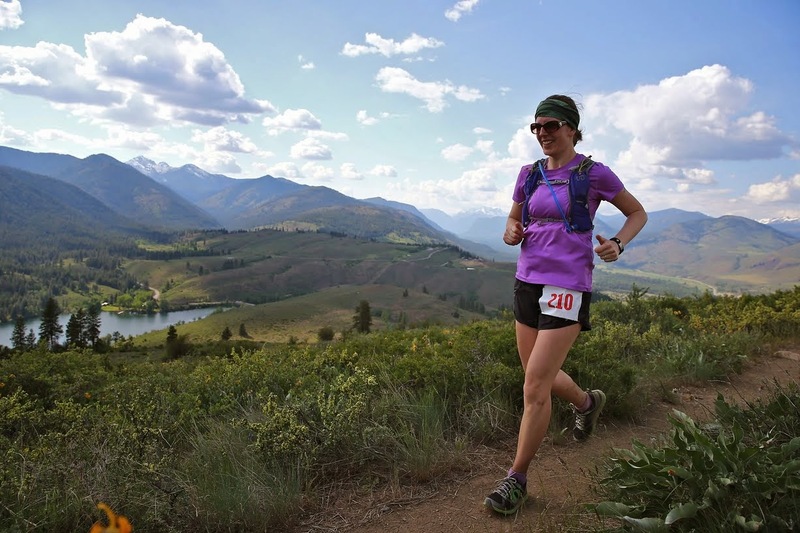 Some fun race photos I stole from the race's website. Tara and I chatted the entire way, save for the top half of some of the steeper or longer hills. It made the miles slip by without notice. Throughout the entire race we were treated to views of Lake Washington and the shore on the other side, as well as the gorgeous houses that the populate the island. The volunteers were extra nice and helpful, and a few locals came out to cheer on runners, which was so lovely. Of course, I need to add, one of the most amazing things about the whole day was that we were running in the most perfect running weather ever. The sun came out around the end of mile 1, the temps were in the upper 40s. Couldn't have been more perfect if we'd specifically ordered it! Thankfully I felt really strong almost all of the time. Around mile 9 my left knee was developing a "niggle". I was worried, knowing my history with ITBS, and hoped that it wouldn't explode in to actual pain. Focusing my energy on making my glutes work seemed to do the trick, however, as the niggle actually went away a couple of miles later. Hurray for strength training and learning how to run correctly! Sadly, this doesn't mean I came out of the race unscathed. After my 10 mile run the previous Sunday I developed a small blister on the inner edge of my foot under my big toe, so I put a piece of leukotape over that area for this race. I thought I was golden, but when I pulled the tape off at home I had two big blisters under it! What the heck?! Back to the course-- many people warned me of the hills-- and like I said, they were truly non-stop, but none of them were too difficult. Most were low and rolling, save for the biggest one around mile 11. That was more work. There was also a short, steep hill right before the finish line, but luckily it turned in to a brief downhill before we ducked under the finisher's arch. The medal, hanging on my medal rack. There were only two negatives about this race. One was the finish line food. We were only offered water, bagels, bananas and oranges. No chocolate milk, no peanut butter, no vendors shilling protein bars or anything (at least not in the food tent). I was really surprised there wasn't more variety, and that there was no protein. The other is that I thought the t-shirts were super lame. Long sleeved, unisex, white, tech shirts. Mine ended up being huge on me (though I wouldn't have worn it anyways) and went straight in to the Goodwill pile. I wish races like this would give you the option of donating the cost of the shirt to the charity-- instead of giving you a shirt to donate to charity, I guess. We didn't stick around long enough to check out the booths or any other entertainment, as we had to go pick up my daughter before heading home. 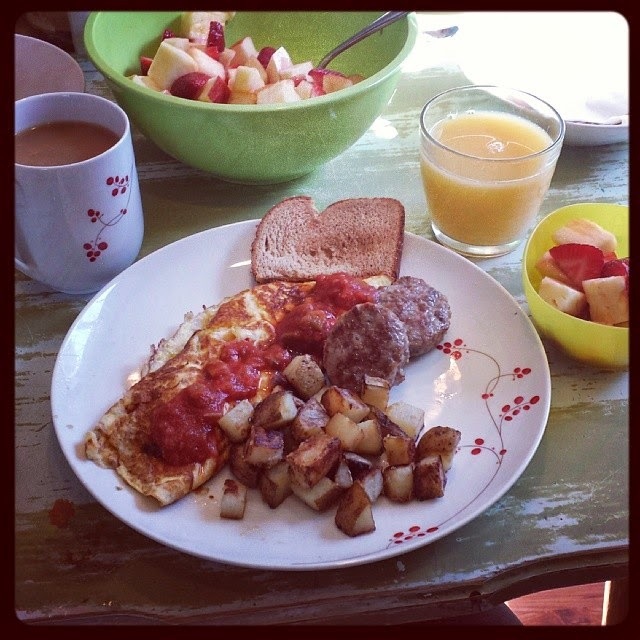 Luckily, by the time we got back to my house my husband had a big ol' spread ready for us-- omelets, potatoes, fruit, sausages, toast, coffee and orange juice! Yum, yum. Post-race meal, hit the spot! After every other half marathon I have run I was completely wrecked for the rest of the day-- this time I felt tired, and sore, but able to go about the rest of the day (albeit a little more slowly than usual!). I took it as a great sign, one that meant I ran the race slow enough, and that I am doing the right things in training to help prevent more injuries. 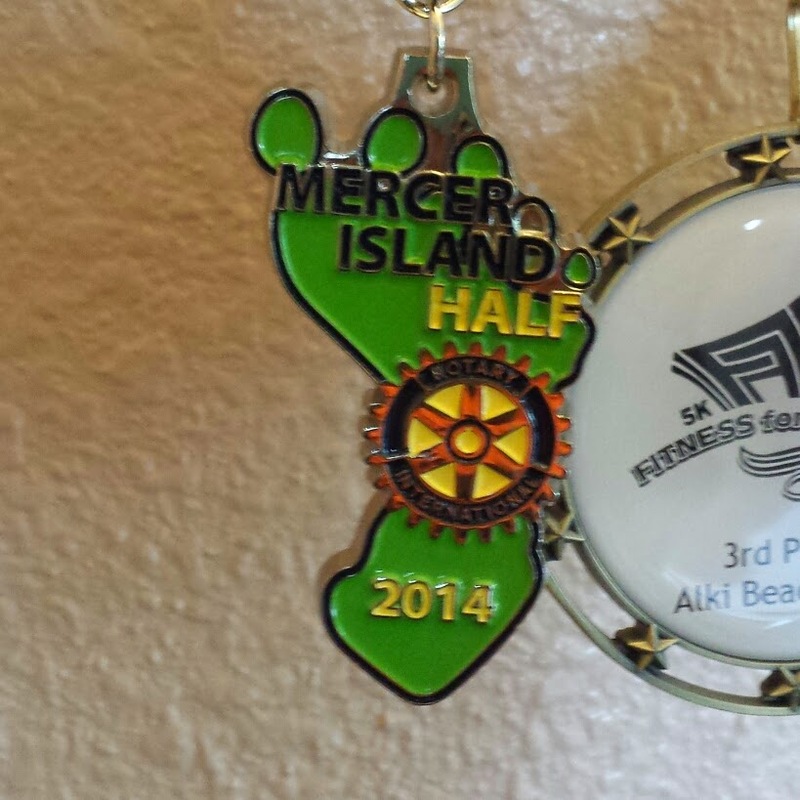 In closing, I would absolutely run the Mercer Island half marathon again! I would also recommend it to any locals who are either well-trained on hills or are open to the challenge. The course is anything but boring!